Imagine broccoli with a nice, thick, cheese sauce. Now add in tender chunks of chicken. Now take that cheese sauce and transform it to a more flavorful version – made with pimiento cheese. Seriously. It is broccoli nirvana! I could eat this dish morning, noon, and night for weeks and still be happy. What’s more impressive is that my husband (Mr. Picky Eater) likes it, too! This is good, old fashioned comfort food in a skillet but it naturally fits into a low carb way of eating as well. We can all enjoy this dish, though, if you’re traveling the low carb road with me right now or on a different road entirely. I do have to hurry up and write this post, though, because staring at this is making me want to cook it again for supper tonight so I’ve got to go get some more Price*s…. 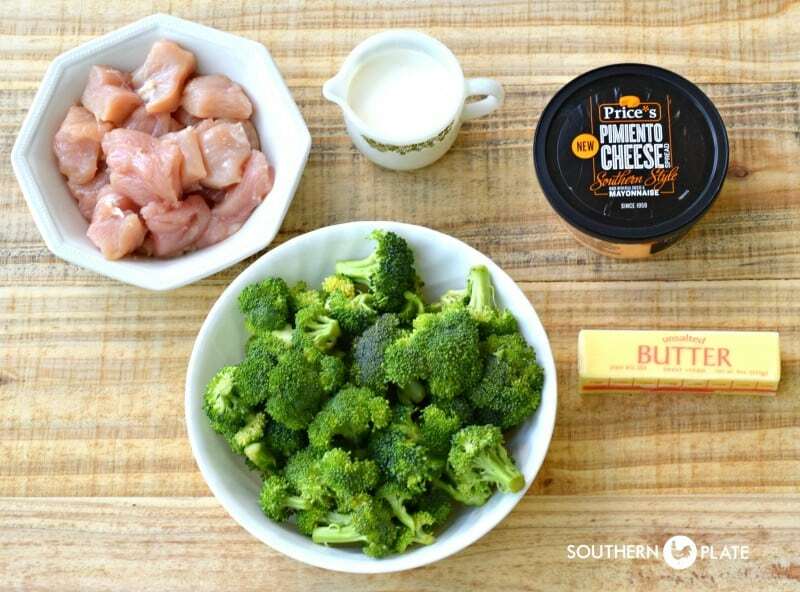 To make this, you’ll need: boneless skinless chicken breasts (Cut into bite sized pieces), raw broccoli (frozen will work), butter, Heavy Cream (can use half and half or milk), and Price*s Southern Style Pimiento Cheese. The Southern Style Pimiento Cheese from Price*s uses real mayonnaise so it tastes (and looks) like homemade. It also makes a rocking cheese sauce, as I am about to demonstrate :). 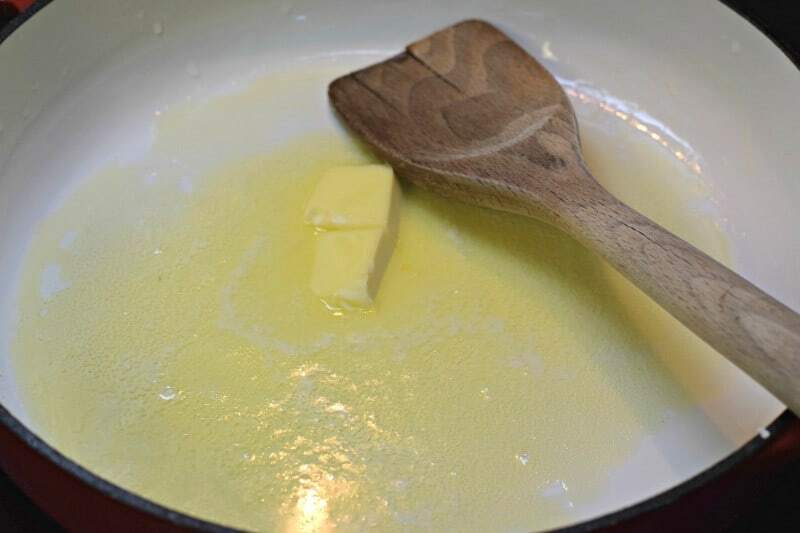 To begin with, melt your butter in a large skillet over medium high heat. Add your chicken and cook, stirring often, until browned and done on the inside. Add your broccoli to the skillet and continue cooking, stirring often, for about five minutes. After this, reduce heat to low and cover. Let this cook on it’s own for about ten minutes, or until the broccoli is tender. 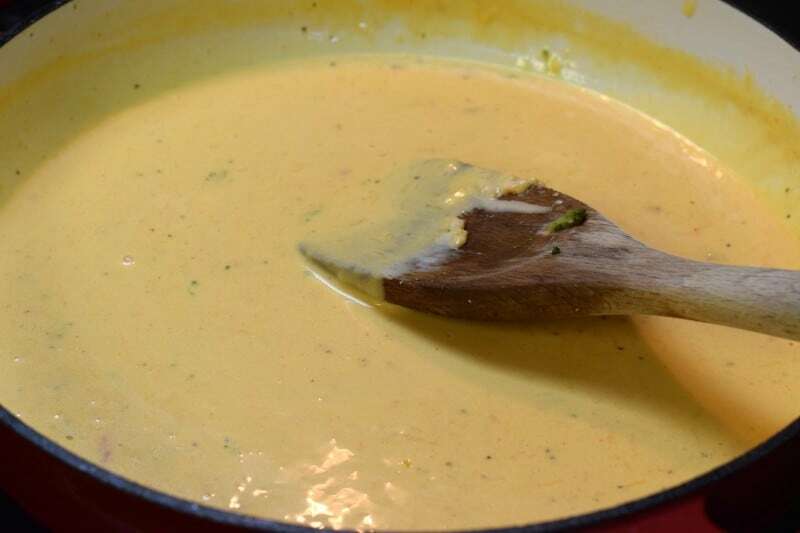 Remove this all to a bowl so you can make your cheese sauce in this same skillet. 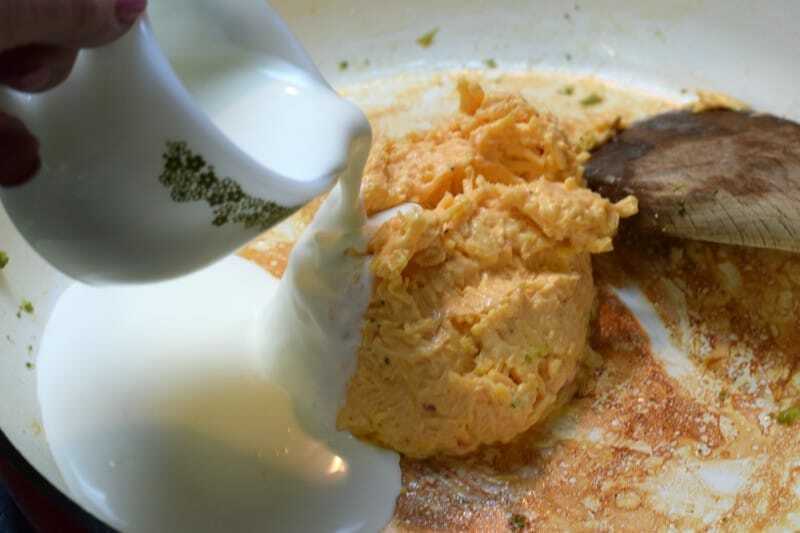 Place entire tub of pimiento cheese and heavy cream in the skillet. Increase heat to medium low. Stir this constantly until it is melted and smooth. This will only take a few minutes. 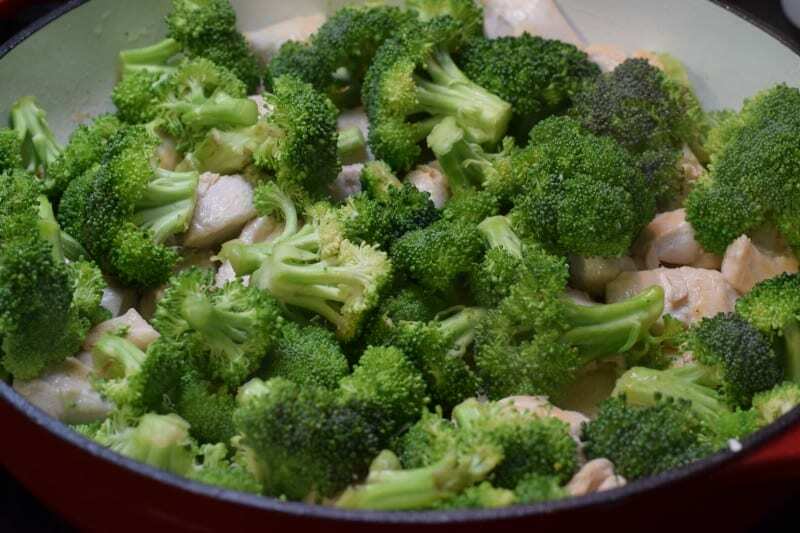 Add chicken and broccoli back to skillet and spoon sauce over, or spoon sauce over chicken and broccoli in a large serving bowl. If you are a cheesy broccoli lover, get ready to meet your soul mate in this dish! Place butter in large skillet over medium high heat until just melted. 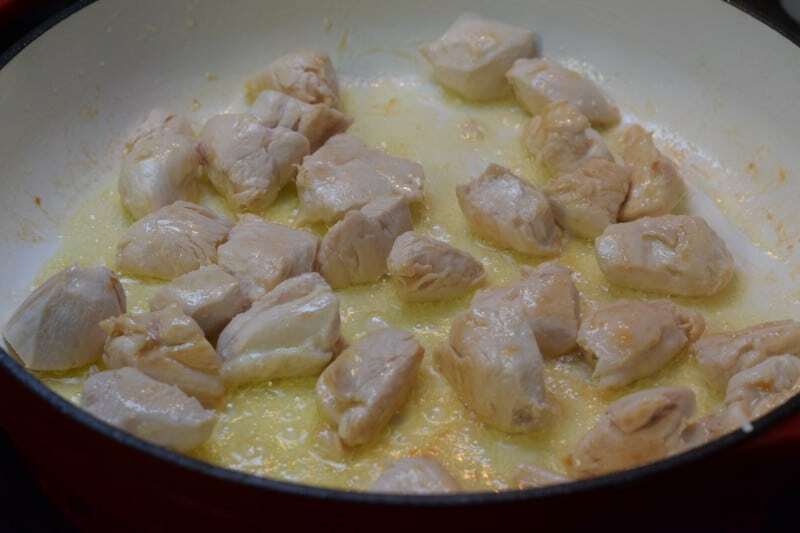 Add chicken and cook, stirring often, until chicken is browned and no longer pink in the center. Add broccoli and continue cooking, stirring often, for about five minutes. Reduce heat to low and cover. Allow to cook for ten minutes, or until broccoli is tender. 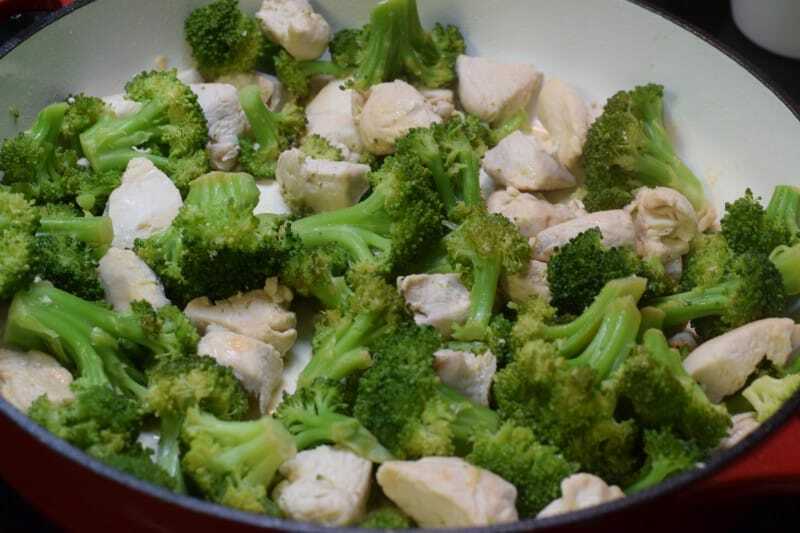 Remove broccoli and chicken to a large bowl and set aside. Place pimiento cheese and cream in skillet. Increase temperature to medium low and cook, stirring constantly, until cheese is melted, smooth, and a nice sauce is formed. This will just take a few minutes. 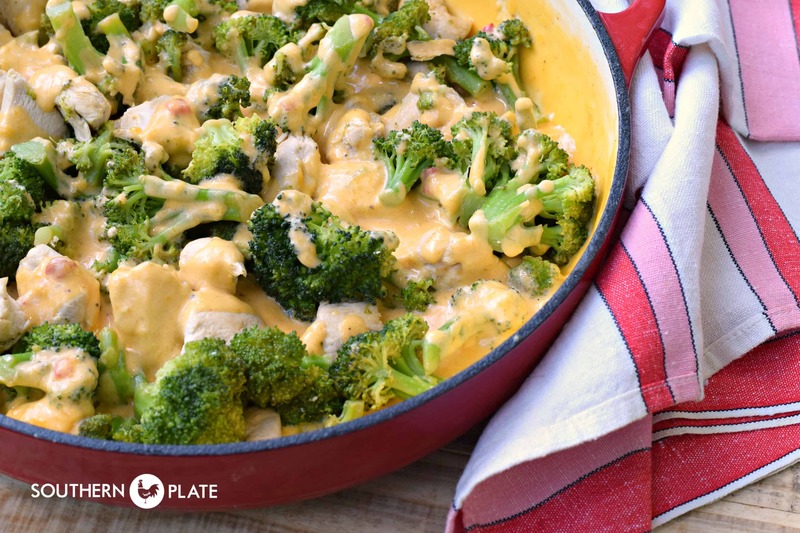 Return chicken and broccoli to skillet and stir to coat, or pour cheese sauce over chicken and broccoli in the serving bowl. This post was graciously sponsored by Price*s Pimiento Cheese. I appreciate them supporting what I do and helping me to bring more recipes to you! I had a lot of fun developing this one but even more fun eating it. It has become part of our regular supper rotation! thank you for the low carb recipes. I am on this journey with you and because of you! you make eating low carb a little more tolerable with your wonderful recipes. You can do this Melinda!! I’m so excited for us! Appreciate the low carb recipes – please keep them coming! Your story inspired me to get on the low carb bandwagon! Same here, Debi. Our journey starts tomorrow, Jun 1st. I must admit that we have thoroughly enjoyed finishing off any high carb leftovers. Tomorrow we’ll do our grocery shopping and load up on meat and low carb vegetables. This is also a great eating plan for Type 2 Diabetics (like me). Welcome to the wagon Debi and Retha!!!! I’m so thrilled to be going along on this trip with you! My grand-daughters are staying with me weekdays this summer. This will be one of many of your recipes we’ll be making for our lunch, the big meal of the day. Yesterday we had your Baked Macaroni and Cheese and Craving Beans. Everyone loved these dishes. We’ve been enjoying your recipes and stories for a few years now and we want to let you know how much we appreciate you. Oh my goodness, what a fun summer you are going to have!! Thank you so much for all of your support and for trying my dishes!! WOW oh WOW oh WOW, Ms Christy – that looks and sounds awesome. I might just have to have some pimiento cheese shipped out west. I do miss it and haven’t had any since 1998 before I moved to Colorado. So until then I’ll make a slightly altered version of it this week. I have the chicken – I have the broccoli – I have the cream – I have some cheese…now to figure out an easy way to have it that deliciously creamy and smooth… Have an awesome day and as always, THANK YOU so very very much. Monika, you should be able to make the pimento cheese yourself. Your grocery store probably carries jars of pimentos on your vegetable aisle. You can use a bag of shredded cheddar, or use Velveta and grate it yourself. Then all you need to add is mayonnaise. Hi Monika! You could also make your own Pimento Cheese. I hope you have an awesome and blessed day as well!! Hey Christy, Looks great. Don’t have quite enough broccoli but do have about a half head of cauliflower in veggie bin that I might sub for broccoli rather than make a trip to the store. As always, thanks for the great recipes. That should work, let me know how it turns out!! Hi Christy that looks so good but we do not have pimento cheese out here in Australia so I think I will sub with sweet chilli philly and see how that goes. I love the chicken broccoli casserole that is in your magazine with the crunch of slivered almonds in it, so this should be good to. Hope all is well with you and your family , god bless from Judi. Blessings to you Judi! I you aren’t happy with the way it turns out you can make your own pimento cheese. Oh cool…I have never noticed Price*s Pimento Cheese in any of my stores before, but their website states I can find it at my Kroger here in Norfolk…I sure hope that is the case…otherwise, I guess I will make homemade Pimento Cheese and then create this awesome, yummy looking dish!!!! I hope you find it Tami!! I think I have just found supper! I hope you enjoy it Pamela!! Thanks for this and the previous post(s) on low-carb Southern cooking. When my wife and I went low-carb I thought Southern food was out, but NO!!! Keep ’em coming, and thanks again! Definitely not out, just changed up a bit!! So glad to hear y’all are doing great!! Thank you for this recipe. I know what we’re having for dinner tomorrow night! Because of you, I have started keto also! A week & a half & I’m feeling great already! Thank you! Thank you! Thank you!! I hope you enjoy it Becky!! That is the thing that has really got me hooked on this way of eating the most, I haven’t felt this good in decades, literally! Thank you for the receipe. I am on the low carb because of you and in one week have lost 6 pounds. Thank you for sharing with us. I’ve gone low-carb since your post last week, and am down 8 pounds. Can’t wait to try this dish. Thank you so much. I have been thinking about this recipe ever since I read it…hours ago. *_* My grocery store didn’t have pimento cheese when I looked tonight, so I’ll have to go to another town, but no doubt about it…I WILL BE ENJOYING THIS VERY SOON! Thanks for sharing. I am wild about pimento cheese and this sounds superb. What an honor to have you making one of my recipes!!! I’m a big fan of yours! This was delicious! After seeing this in your email, I couldn’t wait to try it, and my wife and I were not disappointed. I was a little concerned about all the low carb talk (my wife says I have a low carb intolerance) so I served it with pimento cheese biscuits. Problem solved 🙂 ! I will make this again. I am so glad you liked it John!! The biscuits were a perfect way to solve the low-carb issue!! This looks so delicious! And I love that it is low carb! Hi M K!! Thank you so much, I am playing with the idea, we shall see. This is truly a keeper recipe. Thanks! This looks delicious!! How would you make this into a chicken broccoli rice casserole? Also, I cannot locate Price’s Southern Style Pimiento Cheese Spread. Would Price’s Original Pimiento Cheese Spread be very similar for this recipe? I made my own pimiento cheese spread and it was still a hit! I made this today, and my husband and son liked it so much that they went for seconds. Yay!!!!!! You know, it must be good, if my son (the food connoisseur) preferred it over shrimp etouffee. 🙂 He prefers crawfish instead of shrimp for etouffee. First let me say thank you! I am trying not to eat fast food as much and since coming across this website I have had so many delicious recipes to try that are simple with very simple ingredients. Second let me say this is my favorite recipe that I have tried so far…seriously my picky eater ate 3 plates..this recipe knocked the ball out of the park. 🙂 You are my kind of people Ailina!! I will need to try this recipe using the Pimento cheese. Have you ever try grilled pimento cheese sandwiches? I use mayo on the bread instead of butter when I grilled my sandwiches. Hooray, the Price’s website told me our Vons had the cheese spread, and they did! Not the country style, so I shall add a spoonful of mayo to the sauce. Make it your own, right? Thanks for another marvelous recipe Christy. I am so glad you were able to find it Shelly!! Enjoy that sunshine, we are getting a lot of rain in this neck of the woods lately. Exceptional recipe, we loved it. Hubby raised an eyebrow at the pimento cheese sauce, but he gobbled it up. We always enjoy Christy Jordan recipes. A keeper! Christy, this is a delicious dish. I fixed it today for lunch and my husband said the recipe is certainly a keeper! One change I made was that I used a Rotisserie Chicken. It worked very well. Keep the low carb recipes coming for those of us who need them. Thanks so much for all the low carb recipes. I have all your cookbooks. Would you please consider writing another one of just low carb recipes? I know that would really go over so well. Thank you for help on this journey to lose weight. We appreciate you so much. P.S. I am a fellow Alabamian. I was born, raised, and spent a great deal of my life in Anniston, Alabama! Roll Tide! I have my dinner inspiration for tonight. 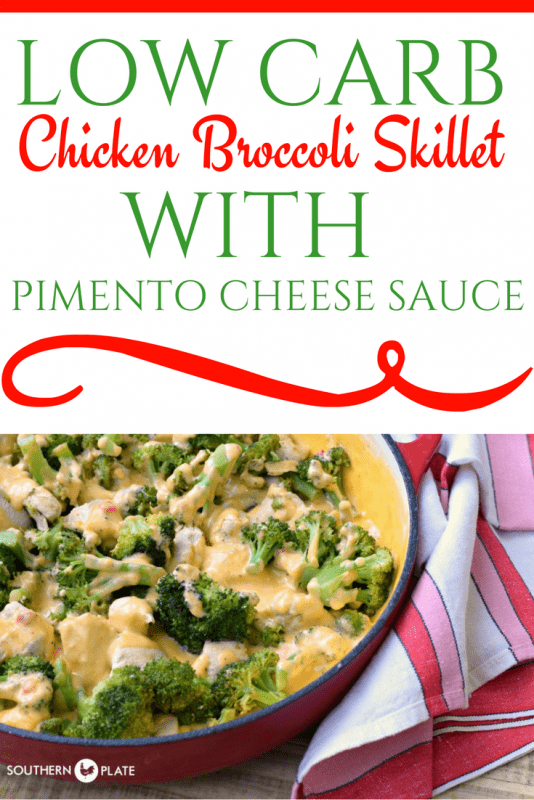 This is just perfect and I love the pimento cheese sauce! I hope you enjoy it Julia! Have a bite for me! !